The Interpolation Error Surface tool takes in a point cloud shapefile and an extent polygon to create a temporary DEM whose values will be compared to the original surveyed values points. The difference between the surveyed points and interpolated DEM are then used to create a new raster surface that represents uncertainty due to the interpolation in the DEM. For conceptual background on this tool and the analysis that can be used with its output click here. 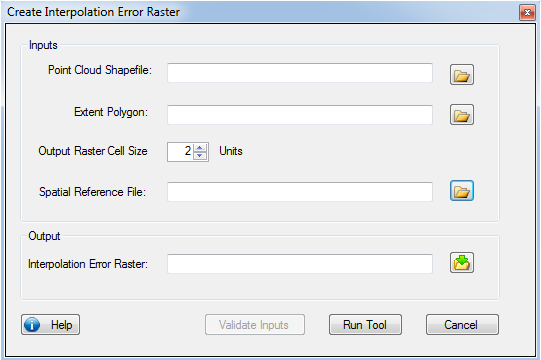 The Interpolation Error Surface Tool is located under the Analysis Tools menu under the Uncertainty Analysis sub menu and the Raster Based sub menu therein. point shapefile containing the original surveyed z values. This file can be created using the Raw Survey File to Shapefile Tool located under the Data Preparation tab. polygon shapefile of the survey extent for the point cloud shapefile. This can be created through in GCD with the Create Bounding Polygon Tool. can be in the form of a .prj file or you can load an existing shapefile that contains a spatial reference and that spatial reference will be imported. This is auto-populated if your point cloud shapefile includes a spatial reference. The cell size to for the interpolation error raster. 2 feet is currently the default. This raster is created from the average difference between surveyed points and the cell that they are within the DEM they were used to create. The absolute value of difference is taken because statistical analysis of the overall distribution of the difference between surveyed points and DEM values is more robust when positive and negative values do not cancel each other out.